Find out how your child will learn to encode – hear a sound and write it down – and what you can do at home to support learning. Encoding is the process of hearing a sound and being able to write a symbol to represent that sound. Decoding is the opposite: it involves seeing a written symbol and be able to say what sound it represents. For example: if a child hears the sound /t/ and then writes the letter 't', this means they are able to encode this sound. By the end of Reception, children are expected to be able to write each letter of the alphabet and know what sound each one represents. They are also expected to be able to write one grapheme (written symbol) for each of the 44 phonemes (individual sounds). Encoding also involves hearing a whole word and then being able to write the whole word with the correct spelling. In Reception, children will learn the letter sounds and then start to put them together to make CVC words (consonant, vowel, consonant) such as hot, nip, ten etc. They will then move onto reading words with consonant clusters (two consonants placed together) such as st, tr, cr, pl, sk, lk. 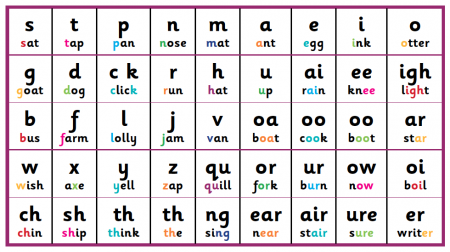 They then move onto reading words with vowel digraphs (two vowels placed together that make one sound) such as ai, oo, ee, ue and consonant digraphs (two consonants placed together that make one sound) such as th, ch and sh. Writing words with their fingers in the sand tray. This helps children to get an idea of how the letters are put together to make a word. Fill-the-gap worksheets, where children have to read sentences with missing words and work out which words (given in a list or box) go in the gaps. They then need to write the words in the gaps, copying from the list. Usually these worksheets will concentrate on one particular sounds at a time, so if the sound was 'ch' the words might be 'chat', 'chin', 'choose' and 'chain'. Giving weekly spelling lists for children to practise at home. Teachers may encourage children to use the 'Look Cover Write Check' strategy, whereby they look at a word, cover it over, write the word from memory, then uncover it and check if they have got it right. They may also give children activities to do at school to support their learning of these spellings, such as testing each other in pairs, writing words on a mini-whiteboard.